Leave it to us when it comes to snowblowers and grass mowers. The details of the following functionalities are displayed when you place the cursor on the icons. 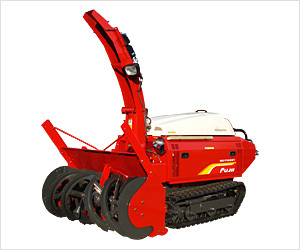 All "Fujii Snow Rotary"s are two-stage snowblower and equipped with a large-diameter augers. The augers are supported at both sides. It gives the augers hugely destructive power. The track rollers of large- and medium-size machines are supported at both sides to ensure stability. You can release the blower brake with lever to replace the shear bolts easily. *Employs a pressed top cover with an innovative design to further expand the operator's front view. *Foot light : equipped light for foot area. Useful for night work. *Reverse buzzer : sounds to caution when reversing. *HST Zero Start : the HST lever returns to the stop position when the driving clutch is OFF to avoid a sudden start. Fuel tank capacity 25.0L / 6.6gal. Copyright (c) 2007 Fujii Corporation CO.,LTD. All Rights Reserved.